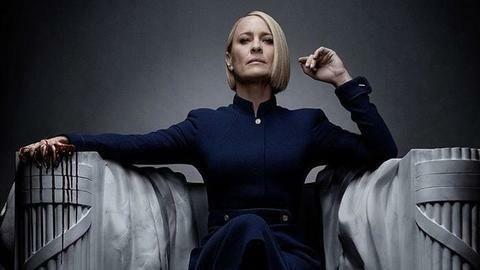 Actor Robin Wright recently revealed that she was initially skeptical to star as Claire Underwood in Netflix's hit series 'House of Cards'. Interestingly, she later fought to save the series after allegations of sexual harassment were put on show's lead Kevin Spacey. She recalled being approached by filmmaker David Fincher, who directed the series' first two episodes, for the pilot of the project. Wright said she initially refused Fincher for the television show. "I had been on daytime soap opera for so many years when I was younger and I thought 'I wanna be in films'. They were two separate entries in 2013," she said. She added that "you can never really feel that we can have the same in-depth content on TV". Wright said that Fincher educated her to say 'yes we can' have the same-in depth content on TV. "He said, 'Don't you wanna be a part of a revolution in this industry where you've been most of your life?' And I said, 'Yeah'," she quipped. The 52-year-old actor was in conversation with Netflix's Chief Content Officer Ted Sarandos at a session during the streaming giant's 'See What's Next: Asia' event in Singapore. Wright said she is proud to be part of a series that has "revolutionized the way we consume TV". "It has changed the way TV is looked upon. Today, turn on TV, (it) is Netflix," she added. The actor, who has won many awards for her performance in the critically-acclaimed series, fought to save the series from derailment after allegations of sexual harassment against Spacey surfaced, and Netflix was in the mood to pull the plug. But Wright stood up for the show and convinced the bosses to give the series a fitting conclusion despite Spacey's firing. Wright, recipient of seven Primetime Emmy Award nominations, believes the final season of 'House of Cards' has achieved its goal. "I think we've accomplished our goal which was to make the most conniving, maneuvering and scheming couple that we could be in politics," she said. Wright directed the series' finale and said the show felt like a "six-year-long movie" to her. "The relationships we have built have grown and deepened. So, to be given an opportunity to direct and learn how to direct on a show that is your family was an incredible experience and I'm so grateful for it because there was such safety," she said. The actor believes as a director, she got to explore a lot on the show. "On the show, we have a very particular style that David Fincher created and you can't use certain lenses...We never use the color red. It was great having those restrictions because you had to work within the Fincher's frame. What a great challenge to cap it off," she said. Wright said there was always the thought that her character, Claire, will eventually ascend to the top, which was indicated in the final moments of the fifth season, when she breaks the fourth wall, a privilege only enjoyed by Spacey's Frank, to say "My Turn". Free from her commitments to 'House of Cards', the actor will now focus on directing and helm a film.